In a live situation, uilleann piper Paddy Keenan is probably the most exciting traditional musician in the world. His inventiveness and willingness to take risks most players wouldn't even think of and pull them off, make his playing an endless source of fascination for traditional music lovers and pipers in particular *. This magic does not always translate onto vinyl or whatever CDs are made of, like the Grateful Dead and Jimi Hendrix, Paddy's best work is never recorded. However, even in the more restraining studio setting, there is magic a-plenty. This is Paddy's fourth solo record although there are, as on his previous three, a range of musicians joining in on most of the tracks. On this CD most of the guests are not fellow tunesmiths, but accompanists of various sorts. Besides Tommy O'Sullivan's guitar there is electric guitar, double bass, keyboards and percussion. Paddy plays concert pitch uilleann pipes and low whistles in E and D.
Some of the tunes featured are old favourites from previous outings such as the tune Cahir's Kitchen which Paddy wrote in the late '60s and recorded in 1983 on Poirt an Phiobaire along with O'Rourke's reel, which also gets a re-working here. A few selections come from a fruitless collaboration to provide a sound track for "Traveller" a film about the Pavees. Paddy acknowledges his link with the Pavees and demonstrates a sincere respect for their separate traditions. Maybe these tunes would have worked well with the pictures but, too often, to this listener, they don't have the force of the traditional tunes sitting alongside them. For example, it comes as a relief when Paddy goes into that old favourite The Mountain Road after two reels of his own. The same could be said, for different reasons, about Tommy O'Sullivan's composition Jutland, a tune which, sad to say, doesn't seem to go anywhere for three and a half minutes. When Paddy does let rip it is pure joy. Now over 50 years old, he is still streets ahead of the hundreds of wannabes and parodists. His signature rubbed thumb D is now an amazingly precise triplet on D, the slides and pinching that characterise his imitators more than his own playing are introduced as variation, he uses the Doran off-the-knee rolled E to great effect, he doubles and trebles notes all over the chanter and he has even nicked a warpipe roll to throw new light on the Bothy Band standard The Hag at the Churn. Overall he plays with tremendous rhythm which shows his understanding of the music and his appreciation for the street player's need to get feet tapping if he's going make a living. Only the on the last track does the shadow of Mickey Mouse creep in when Paddy lays a heavy-handed counter melody on double-tracked chanters, over the crans and tight triplets. This CD features a new set of pipes, copied to Paddy's order from his much used and abused Crowley set, by Grimsby-based master craftsman Dave Williams. The fabulous sound of the full set can best be heard on The Spike Island Lasses where Paddy plays solo, blending the drones and regulators with his Rowsome chanter in a mesmerising mix of sounds. Tommy O'Sullivan provides three songs on the CD as well as the tune mentioned earlier, the traditional Maids of Culmore, Sandy Denny's Stranger to Himself and the country and western standard Killing the Blues. The production is excellent - the two or three accompanists on most tracks never overpower the pipes. The sleeve notes take up six pages of the booklet and are informative, anecdotal and personal and complement the music nicely. There are two sorts of Paddy Keenan records, the great and the absolutely essential. This one falls into the great category, but nobody vaguely interested in uilleann piping can afford not to listen to Keenan. 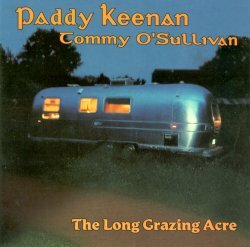 Paddy is controlling the distribution of this CD and his website www.paddykeenan.com only offers it post paid in the US. Try Custy's who got a box of CDs off Paddy on a visit to Clare just before Christmas. * For an example, visit the Uillean Pipers Obsession website www.concentric.net/~pdarcy and listen to The Late Session.